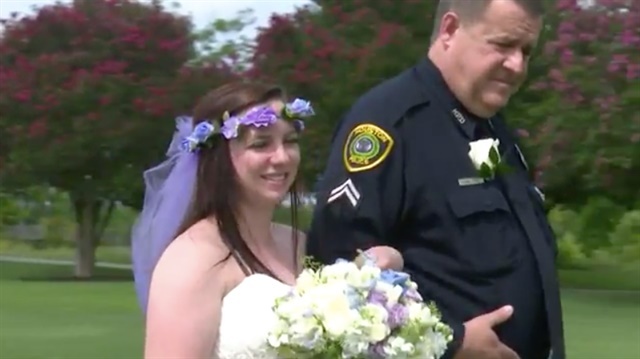 The daughter of fallen Houston Police Officer Richard Martin was married Saturday in front of her “blue family” at the Houston Police Officer’s Memorial. Officer Richard Martin was killed in the line of duty just more than two years ago. As he laid spikes to end a police chase, investigators say a robbery suspect’s car hit and killed the father of two. That suspect would eventually shoot himself and die in the hospital. Cynthia was escorted down an aisle of officers by Houston Police Officers Union president Ray Hunt. In her bouquet, she carried a memory of her father: a single blue rose sculpted from his uniform, KHOU TV reports.